New! All the words for this book have new recordings. Some words in this list appear in earlier editions of the book. They are shown here with an asterisk*. 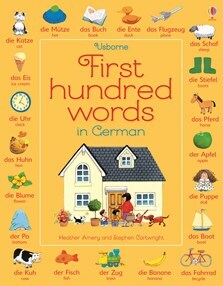 Young children can learn key German vocabulary in this German/English word book, with one hundred everyday words illustrated in busy scenes and with labelled pictures. Colourful illustrations by Stephen Cartwright provide lots to look at and talk about, and there’s a little yellow duck to find on each double page. Includes an alphabetical German/English word list with easy-to-use pronunciation guide. Children can also listen to all the words read aloud by a native German speaker at the Usborne Quicklinks website.